This salad is fast. It’s easy. It’s simple. It’s delicious. It’s – dare I say – my most favorite meal prep recipe during the busy work week! 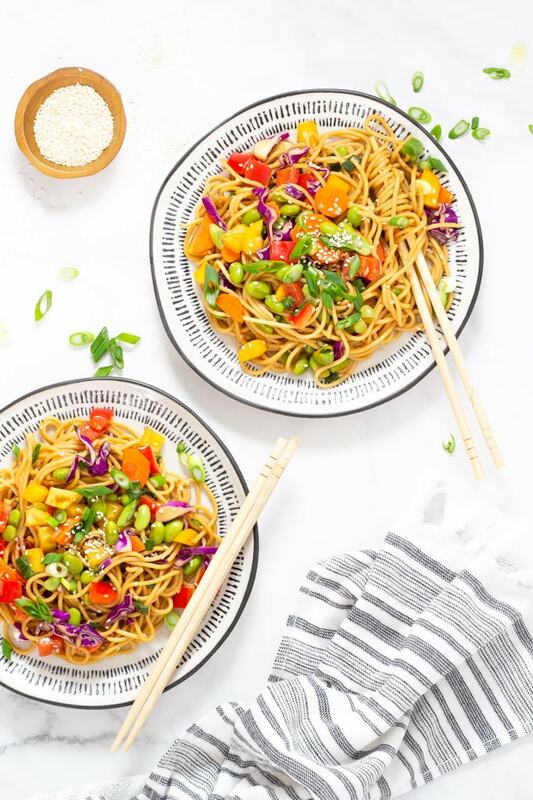 This pasta salad is loaded with fresh vegetables and homemade dressing for a healthy take on a classic Asian pasta salad. 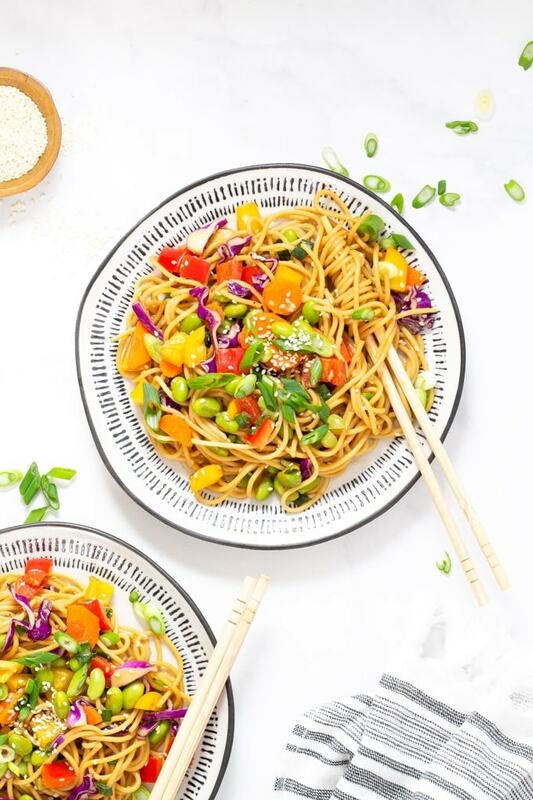 How do I make Vegan Sesame Ginger Pasta Salad? Get ready guys – this my be simplest recipe you’ve ever seen! 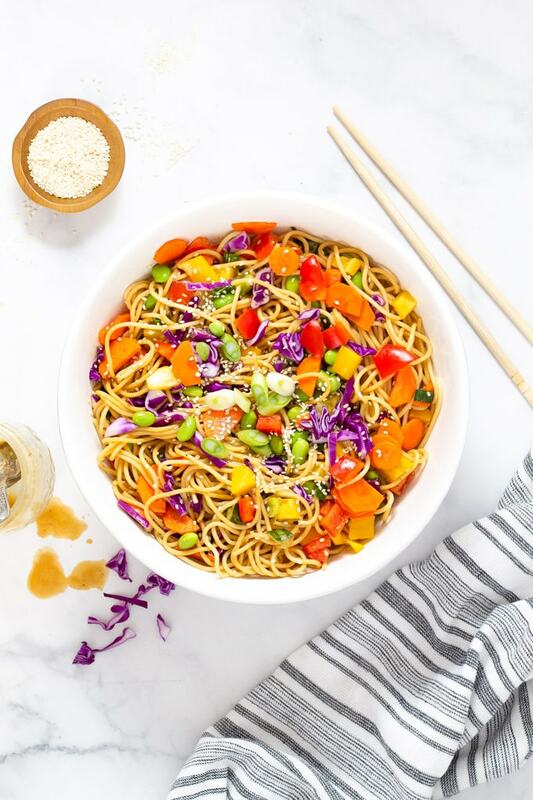 Combine noodles with veggies in a large bowl. Combine salad dressing in a mason jar and shake until emulsified. Pour dressing over salad. Toss to coat evenly. Can you handle all that? I know you can!! 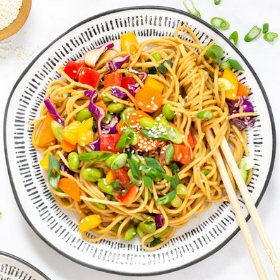 Can I use another kind of noodle in this Asian Pasta Salad? Sure! Use whatever kind of pasta you’d like in this dish. 16 oz. of pasta will give you 8 servings of this quick and easy meal prep recipe! 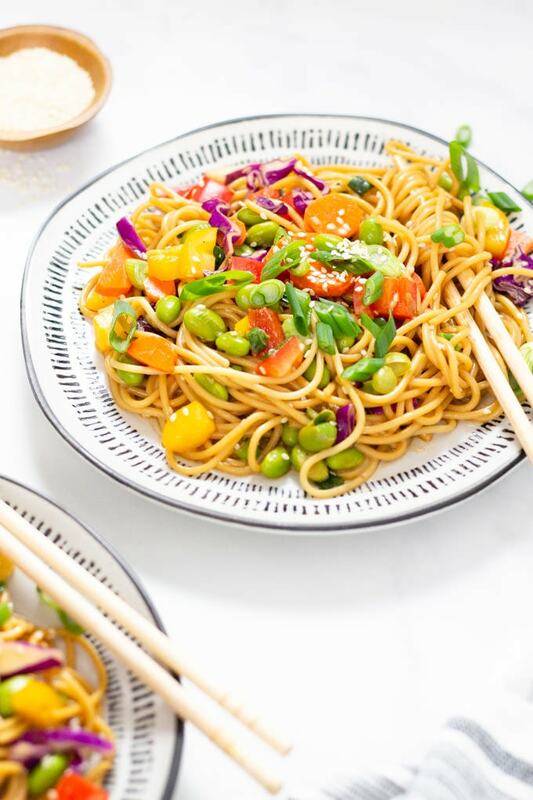 Can I use other veggies in this Sesame Ginger Pasta Salad? Yes! Just be sure you keep the ratios the same. If you’d prefer to add more peppers or even some diced red onion, feel free! Just keep the total amount of veggies listed in the recipe the same so that you have enough dressing to coat it all. Make sure you cook your pasta just to al dente. Nothing ruins a pasta salad faster than overcooked pasta. I always cook my pasta for the minimum time listed on the instructions (sometimes even just a tad less). This ensures that the pasta still has a bit of a bite and will not become mushy when you add the dressing. If you’ll be eating this salad at a later date, just add half the dressing initially. Then add a little more each day just before eating so that the pasta salad doesn’t get soggy. 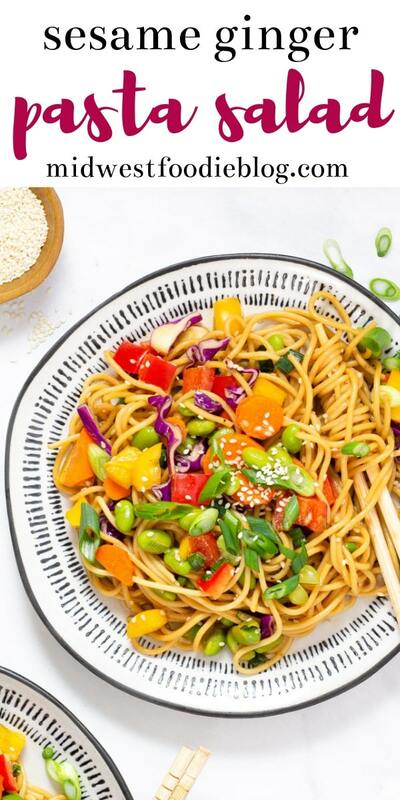 This vegan sesame ginger pasta salad is loaded with fresh vegetables and homemade dressing for a healthy take on a classic Asian pasta salad. Add all pasta salad ingredients to a large bowl. Add all dressing ingredients to a large mason jar and shake it up real good. If you are planning to serve the pasta salad immediately, pour dressing into the serving bowl and toss until everything is well coated. 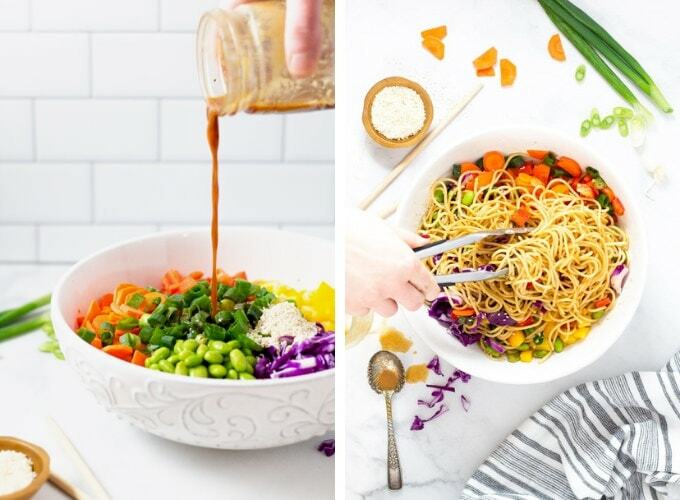 If you are planning to meal prep this recipe like I did, pour about 1/2 of the dressing into the serving bowl and toss until everything is well coated. Then divide into 8 containers and garnish each container of salad with sesame seeds. Each morning before work, or just before serving add another splash of dressing to the salad. This will ensure that the noodles don’t get too soggy and that your pasta salad is still flavorful a few days later. This post was originally published in April 2018. 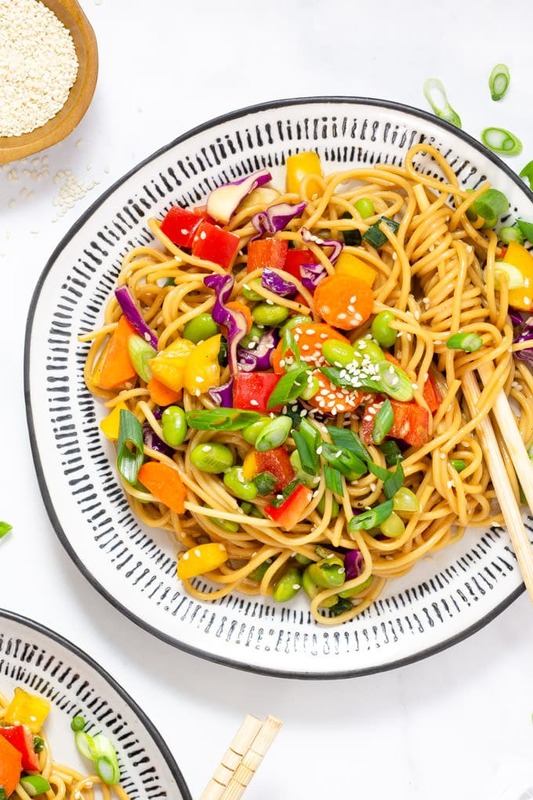 It was updated in February 2019 to include process shots and detailed tips on how to make the perfect Asian pasta salad. 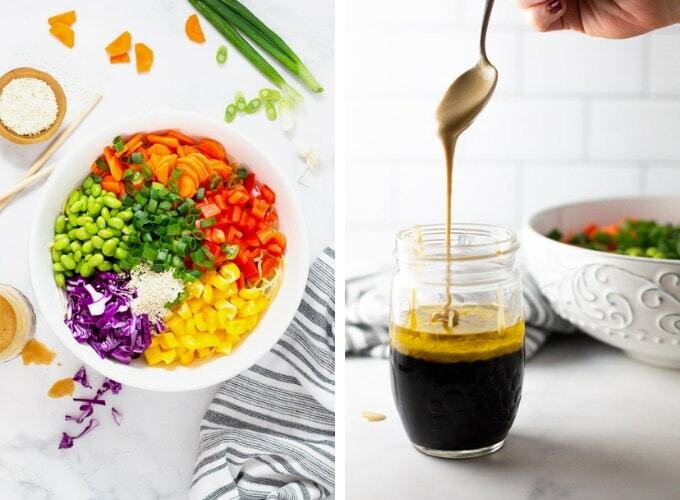 I love all those different colours together and that dressing sounds absolutely delicious! We like your site, it has nice articles, Have a great day! Such a quick and easy meal prep recipes for week’s worth of healthy lunches! This is so good! I didn’t have low sodium soy sauce and used regular- big mistake, it’s way too salty. I also don’t like cabbage so I subbed in chopped snow peas and edamame, and it gave a good crunch. Finally, I also grilled a portobello mushroom and chopped it up in the salad. Super yummy and brought it to work in a thermos for lunch the next day- the recipe is a winner! So glad you enjoyed it Wendy! Your variation sounds delish – I love mushrooms!! Might have to try that next time!